Benjamin Krieg, General Manager, and our hotel's team remain dedicated to your every need before, during and after your stay with us. We look forward to welcoming you to the latest and most dynamic Novotel in Asia Pacific. Feel Welcome! Novotel Bangkok Sukhumvit 20 is located in the heart of Sukhumvit, Bangkok's shopping and restaurant district. A short walk to Sukhumvit MRT, Asoke BTS station and hotel Tuk Tuk transfer is available. Offering 244 guest rooms including Family and Executive suites, a full Executive Sky Club Lounge and free Wi-Fi. Restaurants and Bars include GourmetBar and Food Exchange, Grand Ballroom, Meeting Rooms, Infinity Pool, Kids Club and spa. Do not leave without visiting our highlight rooftop bar, Sky on 20. 4.5 star city hotel in Sukhumvit. A few minutes from Bangkok's greatest shopping malls including Terminal 21, Emporium, Siam Paragon, CentralWorld, Platinum Mall and more. Easy access from both Suvarnabhumi and Don Muang International Airports. 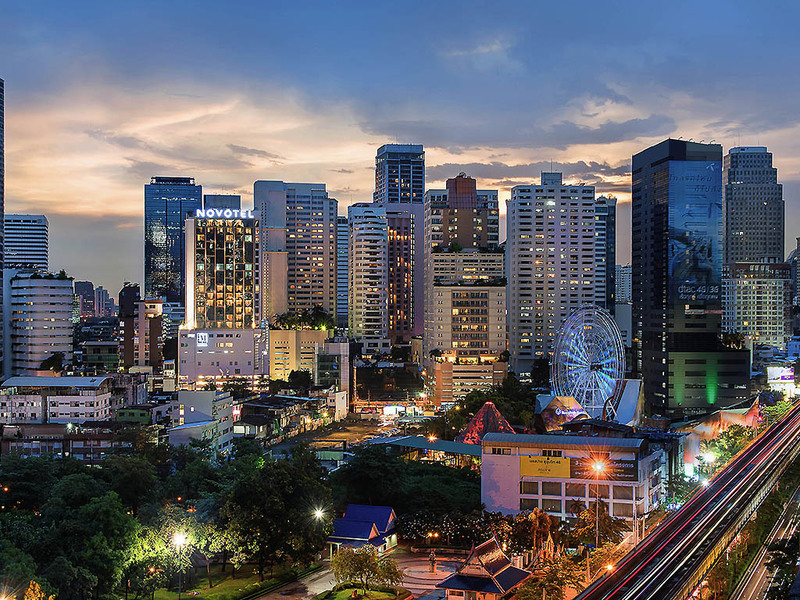 Located in the heart of Southeast Asia, Bangkok is a modern and lively city with a variety of attractions to offer. The bustling city is filled with magnificent palaces, diverse cuisine from world-class restaurants to street stalls and shopping malls. Fiber optic technology provides the highest possible speed of Internet connection. Spacious, contemporary in design and adaptable, the Novotel room is truly a place for living, perfect for all your needs. The restaurant comprises of several individual show kitchens, serving cuisine from both Western and Asian regions. A modern interpretation of Food Markets from around the Globe will give a taste of your travels in the heart of Bangkok's downtown. Gourmet Bar is an informal, friendly eating and drinking space where people want to meet and taste trendy drinks as well as enjoy eating meals served from the bar, in traditional Thai, Western cuisine as well as modern interpretations and fusions. Relax at our 9th Floor Infinity Pool offering great views over Bangkok. Sip and enjoy a cool drink or Snack from our Poolbar on your sunlounge or Poolside undercover dining area. Families can also enjoy a dedicated kids pool and separate kids club. Located on the 26th floor with the spectacular sunsets views and non-stop nightscape of Bangkok. The bar has a full range of wines, beers, and a range of cocktails you may wish to indulge in along with a selection of tapas style snacks and pizzas. I am always impressed by the service quality and product. All the boxes are ticked every time I stay here. The staff were very friendly and helpful, the room was high quality as were the breakfast and other facilities such as the pool and gym. We would definitely recommend. It was enjoyable for our first time at your hotel. Check in was quick and easy. All staff pleasant. Premium lounge good except for very poor range of hot food. As well when food ( sometimes very little ) was finished it was a considerable time to be replenished. Staff there could be a little more proactive. We have used many premium lounges around the world. The hotel was very clean, staff was very friendly and it is in a very good location. I have used the pool, spa, gym and room service and I was very satisfied with all of these services. The room was very clean and quite and the location of the hotel is great. Excellent, some area may needs to be improve. Very nice, a bit troubble with the aircon settings (became very cold at start) but it was perfect and food was amazing. I am however not pleased to see all the mini plastic products. It is not sustainable for the environment. Please provide schampoo, hair balm etc. in larger bottle or plastic that are able to be re-filled. And switch the plastic toothbrushes to bamboo version (there are plenty available in Asia). Comfortable and beyond my expectation. The room was very clean and the facilities were good; I had all I need. The room service was timely. The food at Food Exchange was delicious. Wonderful stay at a lovely hotel! All the staff at this hotel were really lovely, they were polite, friendly and and very helpful. The hotel is clean, the breakfast amazing and the pool area, although small, was a perfect place to spend a couple of hours after a busy day of sightseeing. And then, the rooftop bar! The bar is modern, the staff hard working and the views stunning! What's not to love! Overall satisfy with the service provided. Just that my hotel was located at exit and did hear some noise during the night time and shaver kit was not provided. If upon arrival, refreshment such as drinks to perk up the guest especially during the hot season will be excellent.